One of my favorite ways to kick off a new year is to create a Restaurant Bucket List. I could pretend that I am going to clean out my closet this year, or resolve to eat less cupcakes, but an eating goal seems a lot more achievable. The past few years I’ve created this list (2016 list|2017 list|2018 list), it’s really helped me keep track what new (or new to me) spots I need to sample. Here’s to more carbs, cocktails, and copious amounts of food flights in 2019! Alpine, El Lugar’s sister restaurant, curated one of my favorite meals in recent memory, so I have great expectations for this tapas and wine bar. 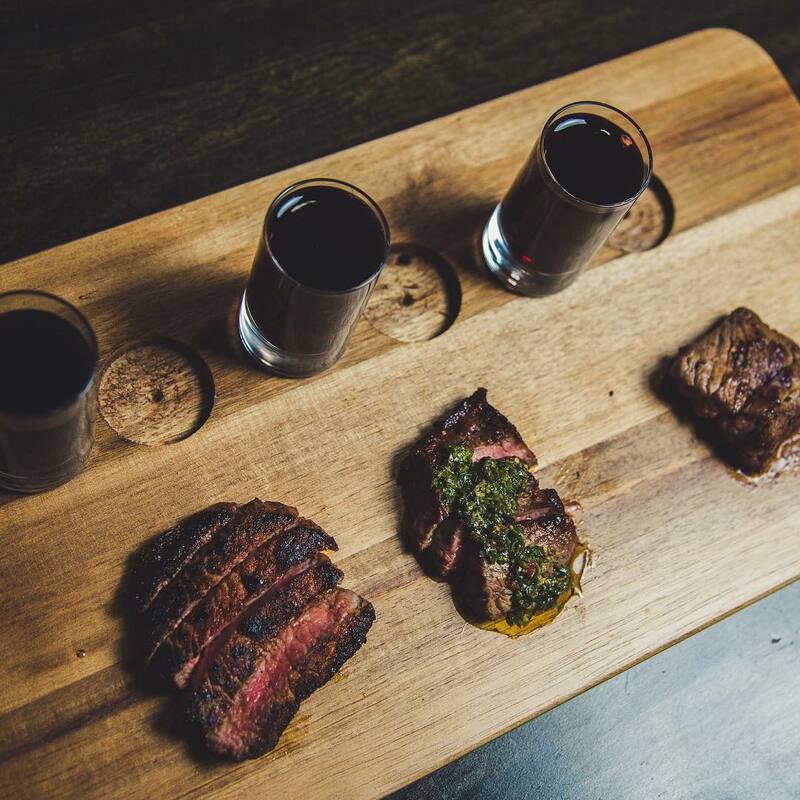 Even more exciting: the steak and wine flights (three steaks expertly paired with 3 reds)! This looks like this perfect place for shareables with friends. Who knew a plant-based menu could get this creative? 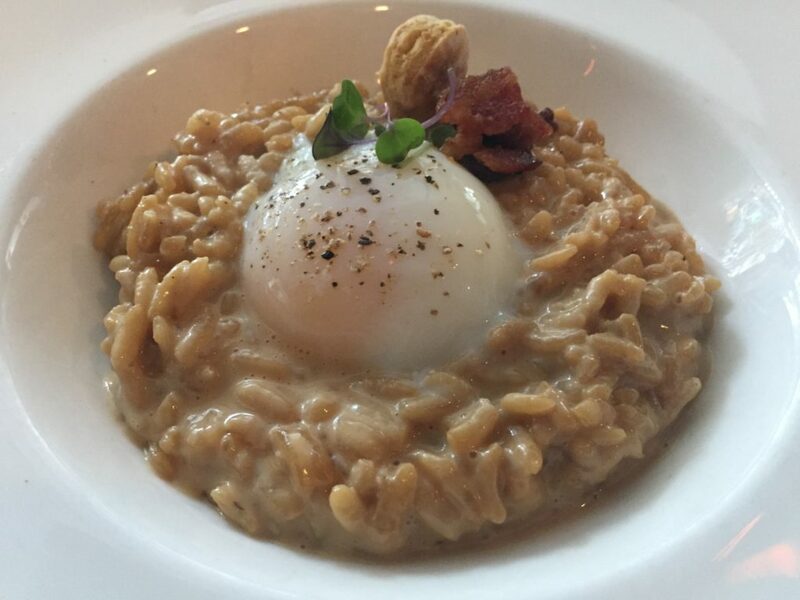 I’ve been eyeing the cuisine at Comune lately, and it looks heavenly. There’s a focus on seasonal and local ingredients here, with dishes like Coconut Squash Soup and the Crispy Fried Rice with kimchi. But the veggie-infused cocktails have me really intrigued: roasted carrot rum and matcha gin sound like must-tries. Another flight situation I need in my life: a gelato flight! This Westerville sweet shop boasts cannoli, coffee, and most importantly, cups of gelato. For the flight, you pick 4 flavors to devour in mini scoop form, and I’m already struggling to narrow down what my choices will be. Earl Grey? Pomegranate? Hazelnut Latte? I can’t wait. 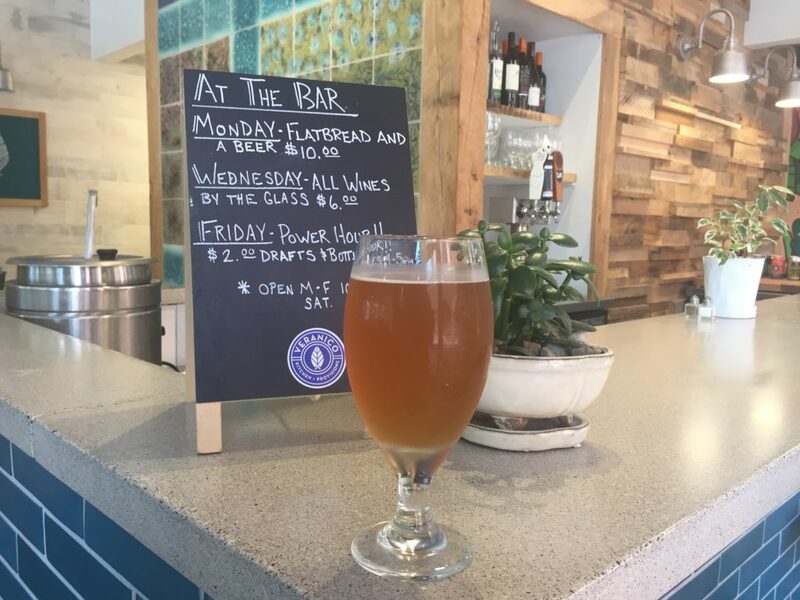 I’ve had Nowhere in Particular’s beers at other locales, when it was a nomad brewery under that name, but I’m more than ready to sip on Somewhere in Particular brew at their new home base in Upper Arlington. Those suds will be washing down some of the scrumptious-sounding snacks on the menu, like Crack Candied Bacon and Beer Queso. You’ve likely seen social media photos of the beautiful beet cream cheese slathered on freshly baked bagels from Lox. I hope to join their ranks and nosh there soon, but it sounds like I’ll have to get up early. Bagels have been selling out fast because the eatery is so popular! Head to their Instagram page for more droolworthy bagel pics. All my blogger buds raved about Helen’s spicy cauliflower dish, so when the restaurant closed, I was disappointed I never made it. Fortuntely, Helen’s and her famous fiery cauliflower meals are back, and 2019 is my year of redemption. I’ve got my eye on the bao and the green onion pancakes too. Coming later in 2019, this Italian Village concept is spearheaded by Cameron Mitchell Restaurants, so I know it will be wonderful. The teasers so far have indicated that there will be 9 restaurants, 3 bars, and pop-up dining at the location, as well as a rooftop patio and games. It’s also right across from Seventh Son, which doesn’t hurt either. Pierogi are my weakness. Pillowy potato puffs that are socially acceptable to slather in butter and sour cream? Yes please. The Summit Street spot is rumored to have a spectacular version, and I can’t wait to try them. Bonus points for the second location coming to German Village this year too. Still more flights here! This time, I’m ready to try “wafel” flights in the Short North. This brand new joint is dishing up sweet and savory waffle varieties that I am more than willing to sample. Why pick between Lemon Creme + Berries or Balsamic Chicken Sriracha waffles when you can get both? Sometimes the suburbs don’t get enough love, but I’ve heard great things about this Dublin favorite. I had a killer cheese plate here as part of the Celtic Cocktail Trail, but I need to return soon for a full meal. Calamari fries and osso bucco, here I come! What dishes have you been drooling over so far in 2019? Did I miss any locales you love? Let me know in the comments below. What is your most influential childhood food memory? When I was 3 years old I ordered steamed clams for dinner, and my Step-Grandmother went crazy! She thought it was so inappropriate for such a young child to be eating food like that! My parents always tell this story because it shows I was an adventurous and enthusiastic eater from the get! I always say that I love to eat, and that’s why I do what I do, the palette has always been my most important tool! What motivated you to open Dough Mama? I always wanted to be my own boss, so that was probably my number one motivation. 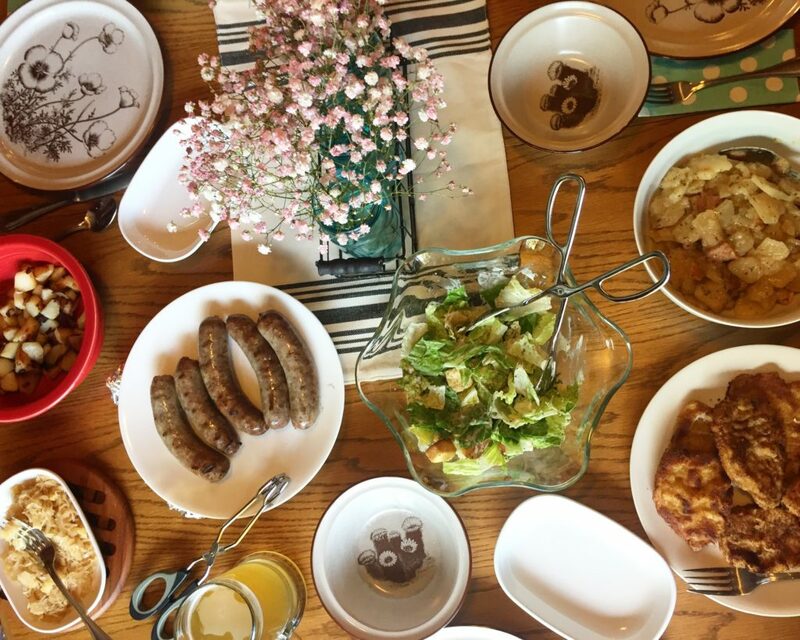 However, when I moved to Columbus, specifically Clintonville, five and a half years ago, there weren’t many places to get brunch, and I wanted some brunch, so I knew there was a hole I could fill. Also, I felt my style, being from another city originally, would bring something new to this ever-evolving city that I love so much. What is your favorite food item on your menu? My favorite food item on the menu is the granola! I love sweet and salty combos and this one has a lot of flavor. I like to put a handful of fruit on top and eat it with almond milk, starts my day off right! 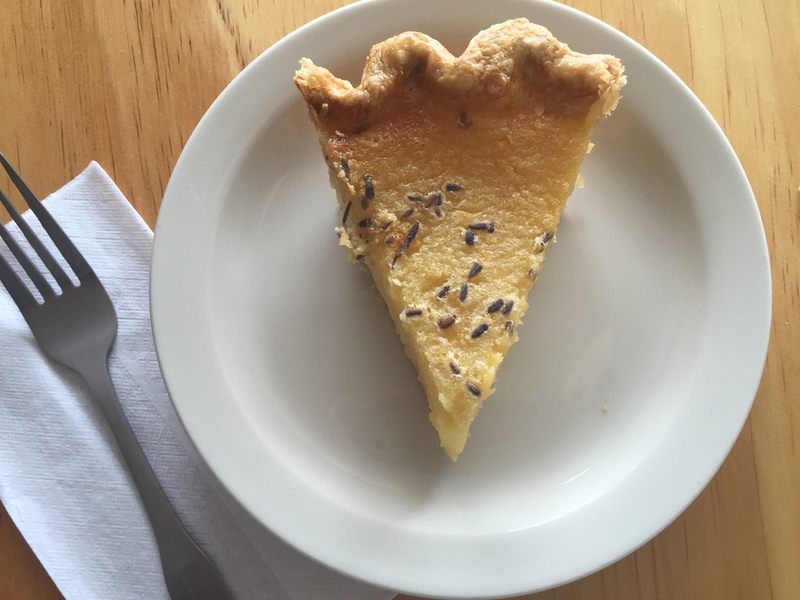 Your pie comes in so many tasty varieties! Where is your favorite place to find inspiration when creating a new flavor? 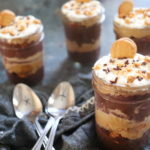 I usually find inspiration for my sweet pies in food that I eat elsewhere. 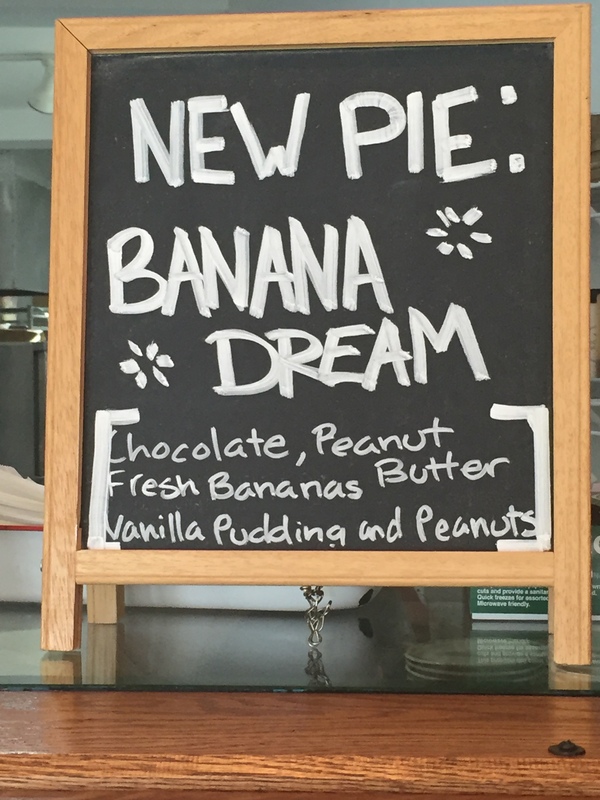 I like to translate non-pie desserts into pies. For instance, one of the first pies I created, and one of my all time favorites, is our Chocolate Orange Cream Pie, which was inspired by those dark chocolate oranges you get in your stocking that you slam on the table and it breaks into slices. I wanted to capture that experience in the pie, so I filled a butter crust with dark chocolate ganache and orange pudding, then topped it with whipped cream and lots of orange zest to ensure it really conveyed the aromatics. How many pounds of flour do you go through in a year? It must be an insane number! Hundreds! Actually its probably closer to 8000, that would be really fun to get an exact amount though! The maple milk featured on the menu is such an wonderfully tasty beverage that you don’t see in Ohio very often. How did you develop this drink? Maple Milk is the the only thing on our menu I can not take any credit for creating! When I was in college in western Massachusetts I used to do a lot of my studying at this amazing cafe on a waterfall called the Montague Bookmill. It was half an hour from my school but so worth the drive. I would spend all day there reading and writing, and they had the most amazing locally sourced food. Maple Milk was on their menu, and I would have one every day because it felt like such a treat. I always said if I ever open a restaurant I would serve that because it’s so unique, incredibly delicious, and it feels good to have items on the menu that reference my past. Can you tell us about your worst kitchen disaster or a flavor experiment gone wrong? I like to know I’m not the only one with cooking fails. Oh I have a doozy. I tell all of my employees this story because it has so many lessons embedded in it and I never want anyone else to experience it! When I worked at a restaurant in Brooklyn called Pies N’ Thighs, we used to make Buckwheat Waffles, once per week, in an 18 quart batch of batter. However Diners, Drive Ins, and Dives, came to the restaurant and once the episode aired, we started making that batch up to 14 times per week! I was in charge of making a HUGE batch, I believe it was 72 quarts (which required separating over 300 eggs! ), and when the prep cook started cooking them, he said they were not right. We tried one and realized none of it had any sugar, and had I tasted the batter before handing it off to the cook, I would have known and could have corrected it! My boss was sooo pissed and really ripped into me, I felt horrible! It had wasted so much time on my part and the cook’s, and it was very difficult to incorporate the sugar back in, especially after some had already been cooked and therefore the ratio had been thrown off. Everyone makes mistakes, but it taught me to ALWAYS TRY MY FOOD before deciding it’s done, and also to be much more focused when mise-ing out my recipes. I’ll never forget it! What cooking tool can you not live without? My favorite tool is a bench scraper! I use it to cut butter, doughs, pick up broken eggs, and nothing cleans better, I love it! Which Columbus establishment do you frequent more than any other? Dan the Baker! Dan is my fiancé, however I would go there all the time even if he wasn’t! I am obsessed with their Lox Bagel, they have amazing specialty coffee drinks, and their Cruffin rotation is really inspiring! Plus I know everything is made with organic and high quality ingredients so I can feel a little better about the calorie intake! What is your favorite locally made product? Palo Santo Spray by Under Aurora! I keep it in my car so I can smell it all the time! It’s glorious! What is your adult beverage of choice? A Mezcal Negroni! It’s hard to find them but when they’re made right they’re SO refreshing! Can you share your go-to recipe to make for dinner at home? Our go-to is roasted chicken. We get an organic chicken from the grocery store and stuff lots of herbs and garlic under the skin. We lay tons of carrots, onion, celery, button mushrooms, and fingerling potatoes underneath, with lots of salt and pepper, a couple of whole heads of garlic with the tops cut off, and squeeze lemon juice over them. Then we make a rub out of salt, pepper, lemon rind, paprika, and olive oil and rub the chicken down. We put the chicken on a rack over the veggies in a deep pan and cook until the skin is nice and crispy. The veggies get caramelized and are so incredibly flavorful, the dish is simple, delicious, and pretty healthy. Do you have a local charity or community organization that you would like to promote? There are so many amazing ones, but right now a lot of my focus is on Planned Parenthood. I am a huge believer in women having the right to self-determine what they do with their bodies and I believe everyone should have access to good healthcare. I support them personally and we often have gatherings at the shop for people to learn more about the organization, and we do the Columbus Flea as well which gives a large portion of their profits to Planned Parenthood. Do you have any fun hobbies or talents, other than making wonderful pies? I play the banjo! I don’t have much time for it anymore, but I love to pull it out and play for hours, it’s very relaxing. You recently expanded to selling your treats at the Dublin Farmers Market and were also a featured baker at Flavored Nation. 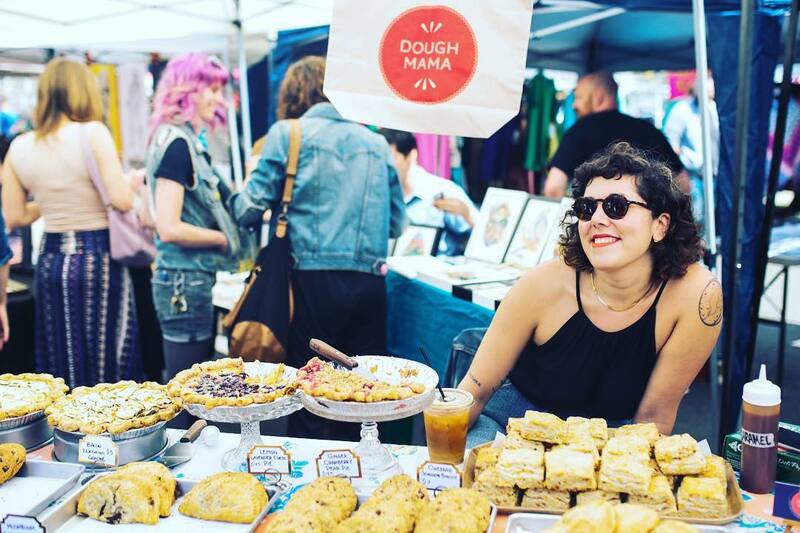 Can you tell us more about what’s next for Dough Mama? We’re hoping to do more markets. It’s so fun to connect with customers from other areas face-to-face! I also love connecting with local growers and makers who are also selling at the market. That’s how we source a lot of our ingredients. Collaboration and community are so important! Also, in the spring we will be opening for dinner! It’s a huge undertaking so we’re really taking our time, but we can’t wait for everyone to try all of our new dishes! 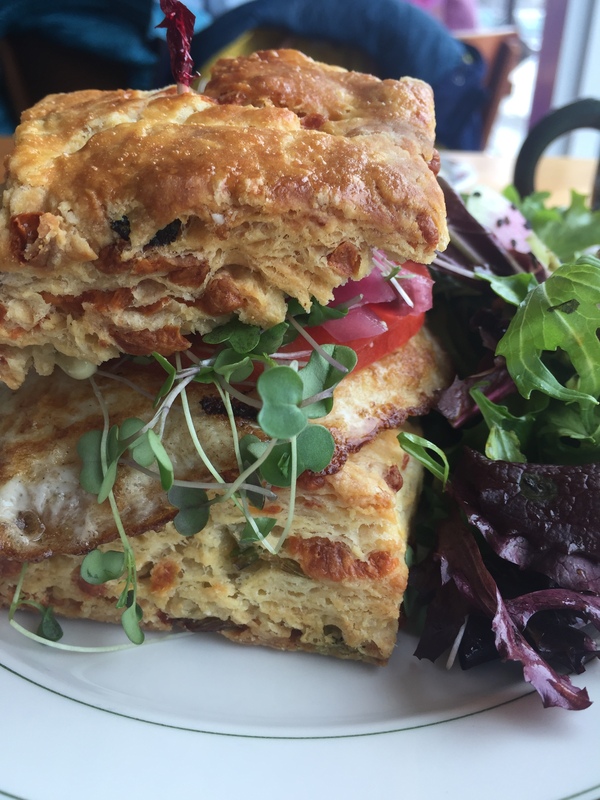 Don’t forget to stay tuned for Dough Mama’s dinner service announcement, and in the meantime, head over to Clintonville for scones, sweets, and avocados galore. 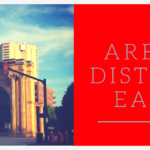 The Arena District is more than just a place to dine when you’re attending a Clippers or Blue Jackets game! Although it’s an incredibly convenient place to visit for a concert or sporting events, I’ve been spending a lot of time in the area lately doing one of my favorite things – devouring delicious food! Throughout the course of this Arena District eating adventure, I’ve discovered a major obsession (the locally-sourced fare from Veranico, and especially their shortbread cookies), a new spot for brunch (hi, cinnamon roll pancake from Sunny Street), and loads of craft beer too. 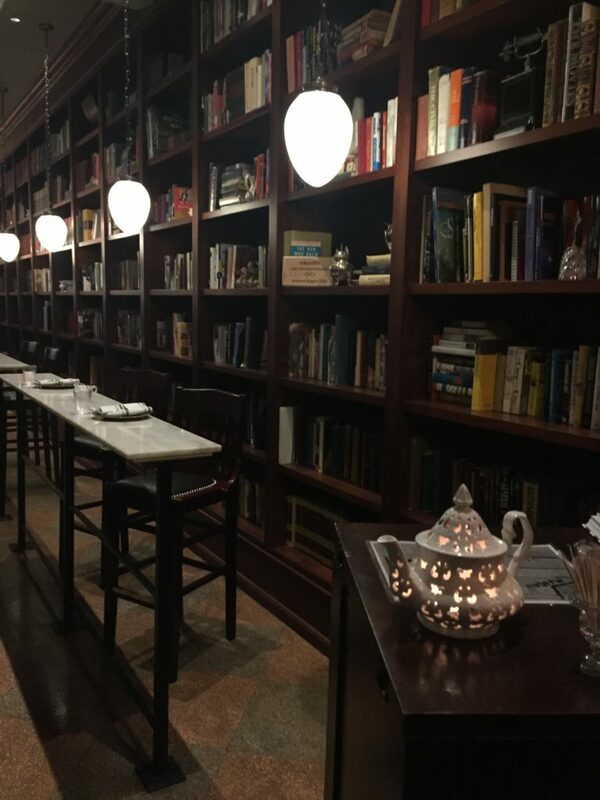 Whether you’re seeking brunch, dinner, or drinks, the Arena District has you covered – just keep on reading. 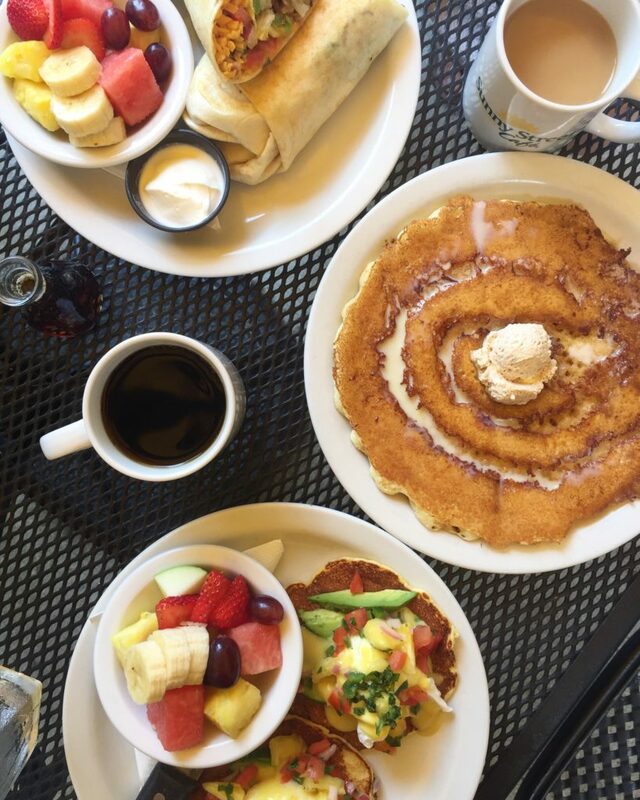 If you haven’t hit up Sunny Street Cafe yet for brunch and tried the aforementioned cinnamon roll pancake, you are missing out. This confection has an actual swirl of caramelized crunchy bits in the batter, plus a dulce de leche drizzle. 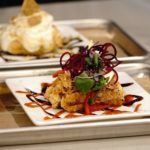 If savory is more your style, there are some unique selections here as well – think stuffed biscuits and gravy or chorizo chili Tex Mex omelettes. The cute patio tucked on the side of the building is a beautiful spot for warm weather people-watching while you sip your coffee. There are also different kinds of flavored creamers on the table (this is important to me, ok?) and Sunny Street features Ohio maple syrup for their sweet dishes. I wrote about Veranico in more detail here, but I can’t say enough good things about this concept. The salads are enormous, laden with toppings, and make even this anti-greens lady love their offerings. This spot is fast-casual but still gets as many ingredients from local farmers as possible, in addition to sporting craft beer, panini, and some utterly craveable baked goods. Some other spots to sample: Zoup (feauring 12 daily varieties of warm and hearty soup) or a bison burger at Ted’s Montana Grill. I’ve got nada but good things to say about Nada. 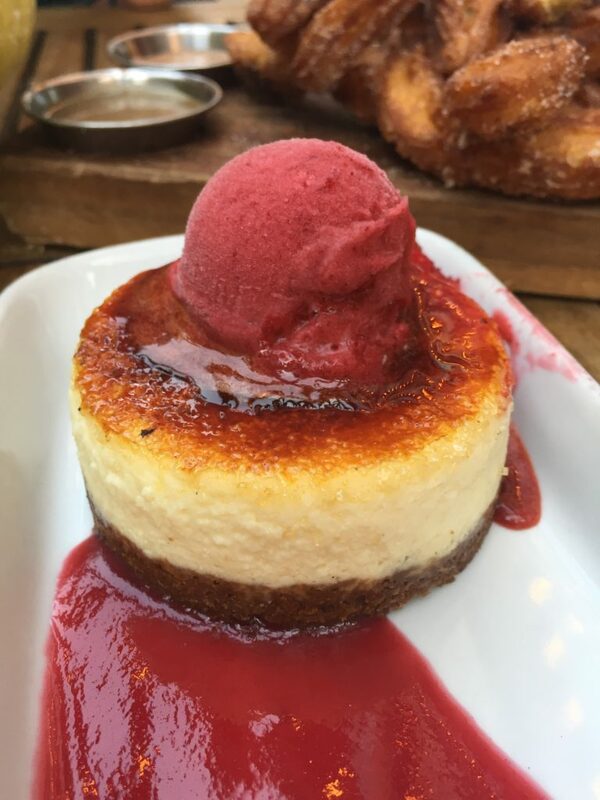 It’s located right across from the Arena, has pork belly tacos, and a divine cheesecake with berry sorbet on top. This contemporary Mexican joint also makes a mean margarita and has a hip happy hour, meaning it’s an ideal venue for almost any occasion. 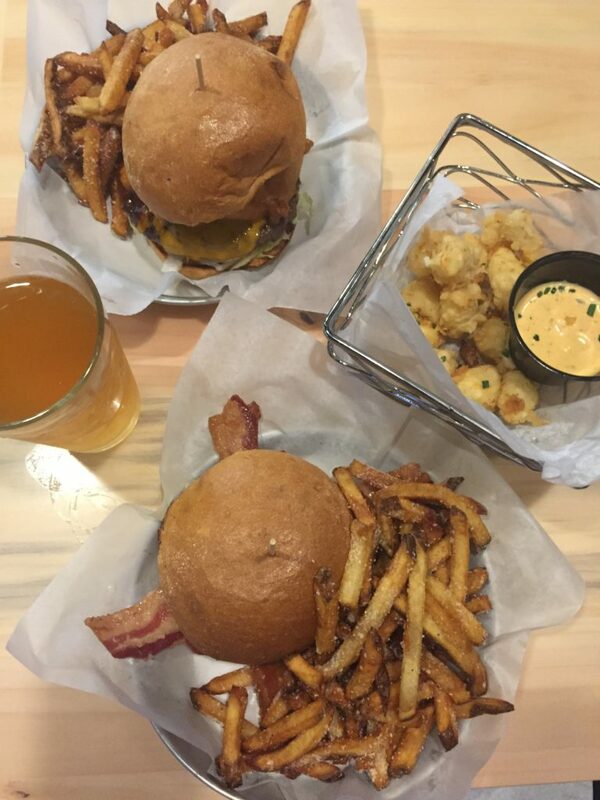 For burgers and brews, Half Pint is the perfect pre-game spot, or just to catch up with friends. The Pint Room’s sister spot boasts dozens of beers on tap from all over, and I can’t get enough of the just-crazy-enough PBBJ burger: peanut butter, bacon, and strawberries piled high on a patty. 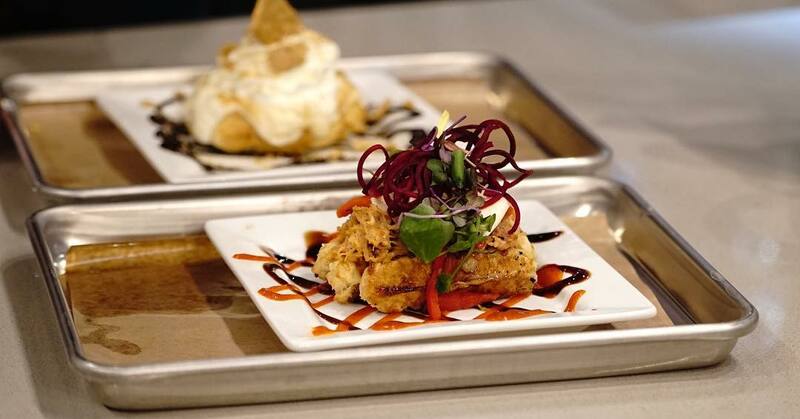 Gordon Biersch is another crowd-friendly option for suds and spuds. The restaurant has beer flights with a fun twist: you pick 5 mini beers to taste, and your server surprises you by picking out the sixth one. 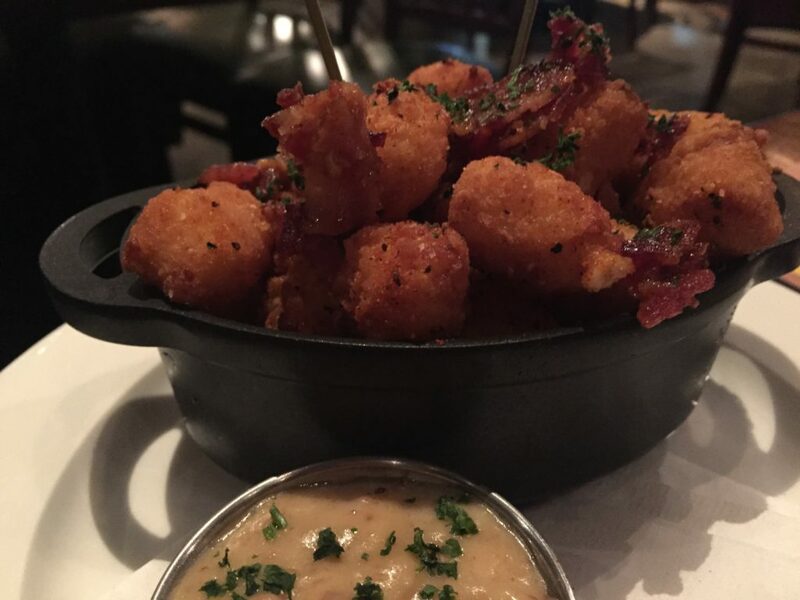 My husband and I both raved about the cheese curd appetizer too – these fried nuggets are dished up with a sprinkle of candied bacon and side of creamy bacon dip for dunking. Definitely ask for extra of this stuff, because you won’t want to share. Other munchies you must order: the bottomless Legendary Garlic Fries, sky-high bread pudding, and the Marzen beer-glazed wings. More dinner destinations: Buca di Beppo for some seriously huge portions of Italian food, or Boston’s the Gourmet Pizza for pie in every style imaginable. Additional fun spots for drinks: With a group, Big Bang Piano Dueling Piano Bar always makes for a memorable musical evening, or try the Three Legged Mare for bourbon, whiskey, and Irish pub grub. Culinary Clue: Looking for a place to park? Many of the Arena District area restaurants offer $3 validated parking for the first two hours when you dine with them. Get maps and details here: https://arenadistrict.com/parking/. Make sure you take the time to stroll around the area as well; there are some gorgeously landscaped nooks and parks hidden in throughout! Disclosure: The Arena District invited me to visit some of the restaurants on this list and receive complimentary meals. All opinions contained within are my own. 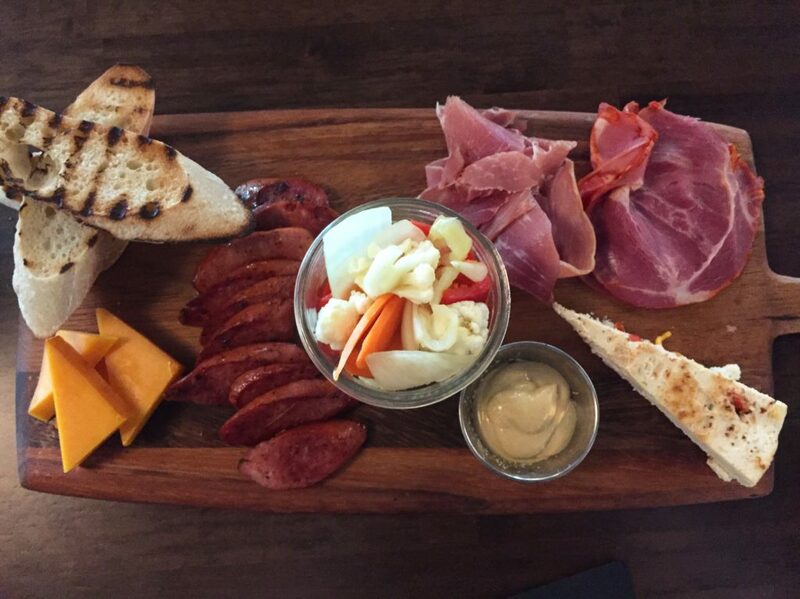 In addition to having incredible beer and a craveable burger, the charcuterie at Rockmill Tavern is a guaranteed crowd-pleaser. The pickled veggies are tangy and delightful, and the portion is generous. Frequently, this dish features dark chocolate, which it turns out, is a wonderful compliment to the savory items on the board. Click here to read my full post on Rockmill Tavern. Dabs of jam, in-house cured meats, and plenty of treats for all on this cheese board! I love that you can scale the size of this charcuterie plate for one, for two, or family-style (four meats, three cheeses, and plenty of accoutrements). Plus, the offerings on this dish change all the time, so even on a return visit there will be different seasonal ingredients. 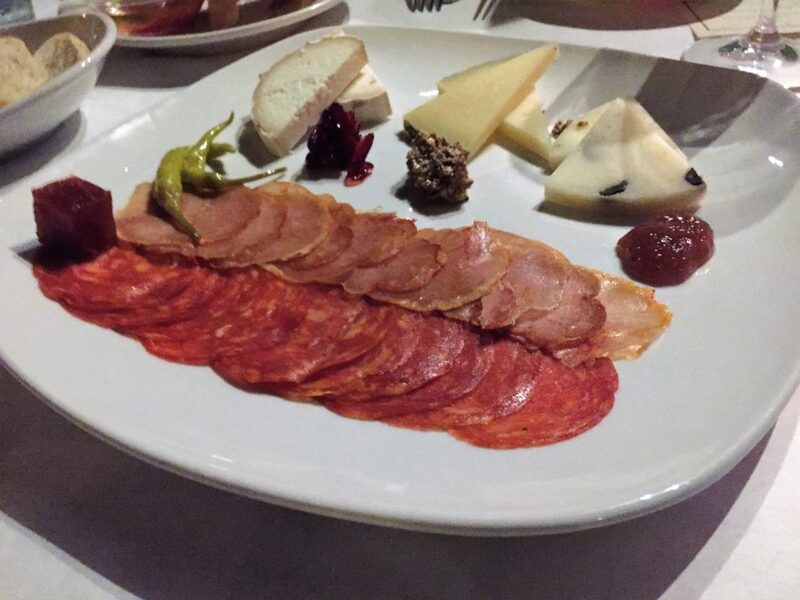 For a Spanish slant on charcuterie, head to Barcelona in German Village. The tapas restaurant lets you build your own ideal appetizer, selecting from a number of unique meats and cheeses in any combination you prefer. Think Serrano ham with grilled flatbread, buttery cheese served alongside sweet quince paste, and pork with pepper relish. Add some Marcona almonds and mixed olives and you’ve got yourself a meal. The Market is guaranteed to impress with its colorful and composed platters; the wonderful components often change on the chef’s whim. Wednesdays are wine flight and charcuterie night, and you wouldn’t want to miss that would you? Bonus: if you’re hungry for more cheese after the charcuterie course or are a vegetarian, order up the Le Délice De Bourgogne dish too – it’s essentially fancy waffle fries that come come drizzled with honey and a wedge of cheese to spread on them. Click here to read my full post on The Market. 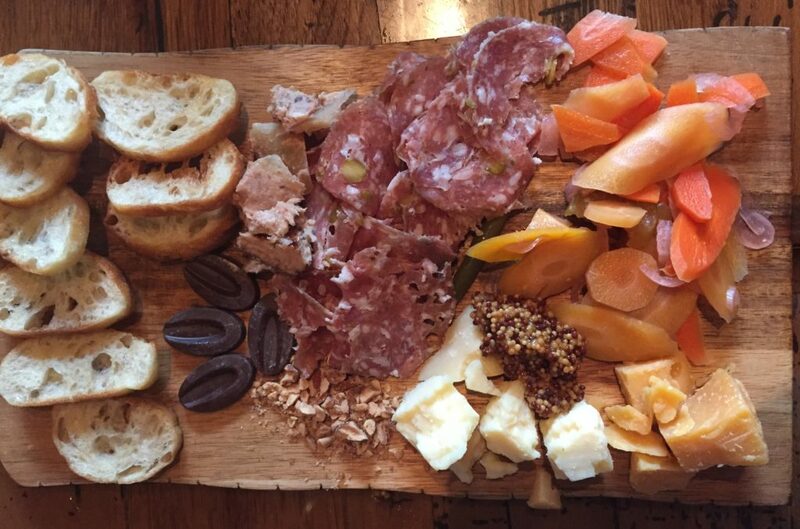 This new locale at the Bridge Park area in Dublin has a surprise twist on the charcuterie plate: garlic cheesecake. It sounds crazy, but is more of a spreadable, creamy delight perfect for slathering on baguette slices than it is a dessert. The smoked cheddar, sausage slices, and pickled veggies were all tasty too. I like to take charcuterie platters on the go as well, for picnics or outings to breweries that don’t serve food. 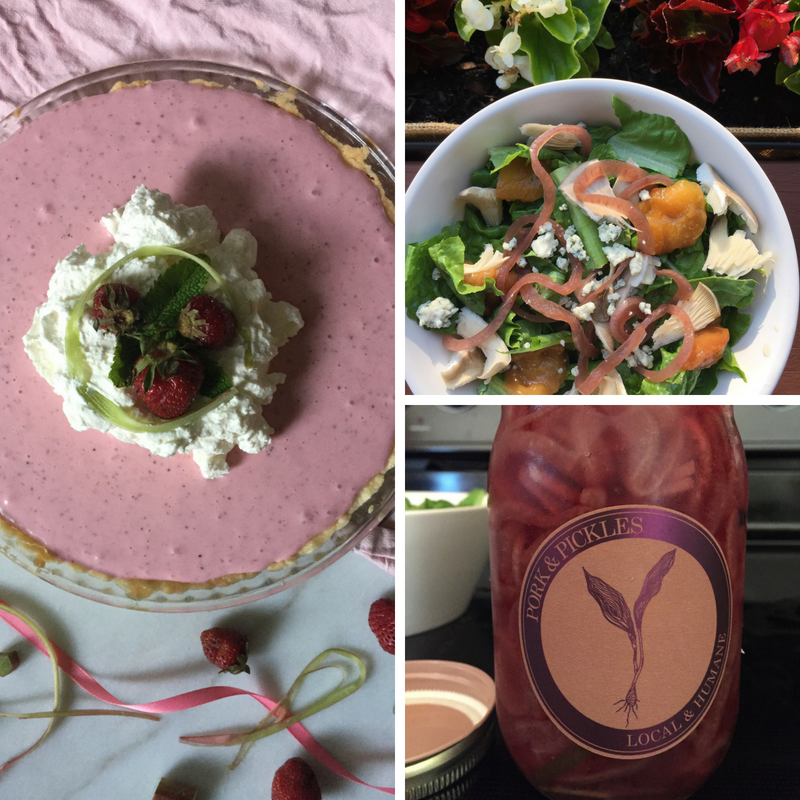 Katzinger’s Deli and Black Radish Creamery in the North Market will help you create a great plate for carryout, or pick up North Country Charcuterie and locally made cheese at a farmers market and you’re set. 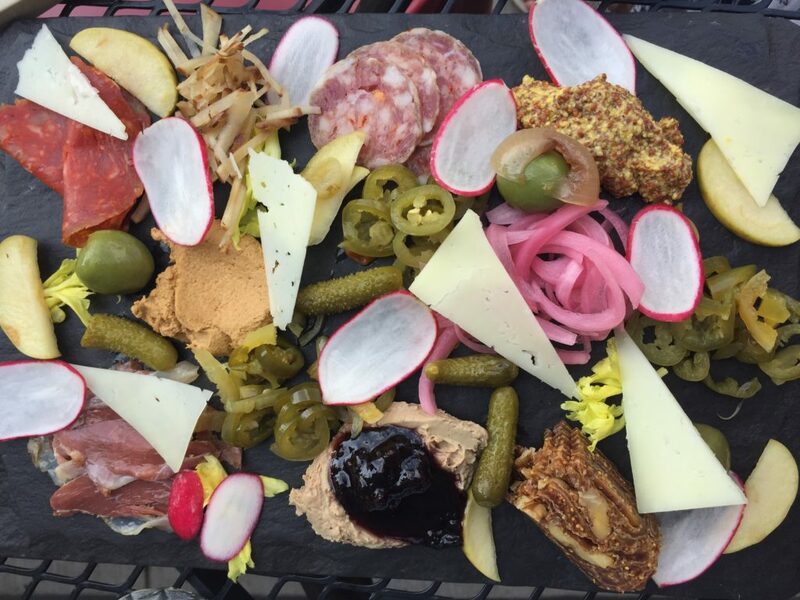 Have another Cbus spot where you love to enjoy charcuterie plates? Let me know in the comments below! If you follow this blog at all, you probably know about my admiration for the Cameron Mitchell family of restaurants. I love the patio at The Barn, can’t get enough of the chocolate cake at Cap City, and dream about the sushi at Hudson 29 constantly. This month, Cameron Mitchell Restaurants is celebrating its 25th anniversary! There’s no better way to say thank you to this Columbus dining trailblazer than by visiting their latest concept, Harvey & Ed’s, and writing about my experience. Named for the Chief Operating Officer’s father and uncle, Harvey & Ed’s opened this past June in the Short North. 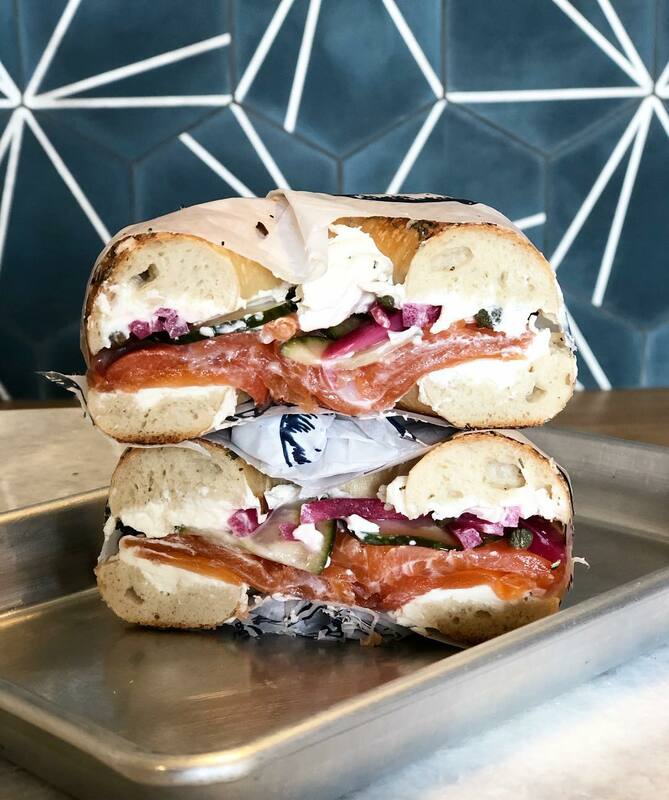 The new spot provides a fusion of Jewish deli fare with classic CMR touches: flawless service, creative cocktails, and an upscale atmosphere; it’s a type of cuisine that can’t be found elsewhere in the city. I love Katzinger’s for a traditional deli sammie, but this is a great alternative when you’re looking for something different. Start with a beverage, spiked or simple, because there are a plethora of options. The blackberry house-made soda was colorful and refreshing, or go traditional with a chocolate egg cream. If you’re leery about raw eggs, please note that despite the name, egg creams are just chocolate milk and seltzer. They’re a frothy and tasty sweet treat served in a miniature milk jug. The Boozy Egg Cream version is a scrumptious sipper too, with the addition of tequila and chili liqueur to the original (it sounds odd but trust me on this). I enjoyed the Real Mensch too, a concoction sure to cure your winter cold – it’s scotch, lemon, and honey on the rocks. 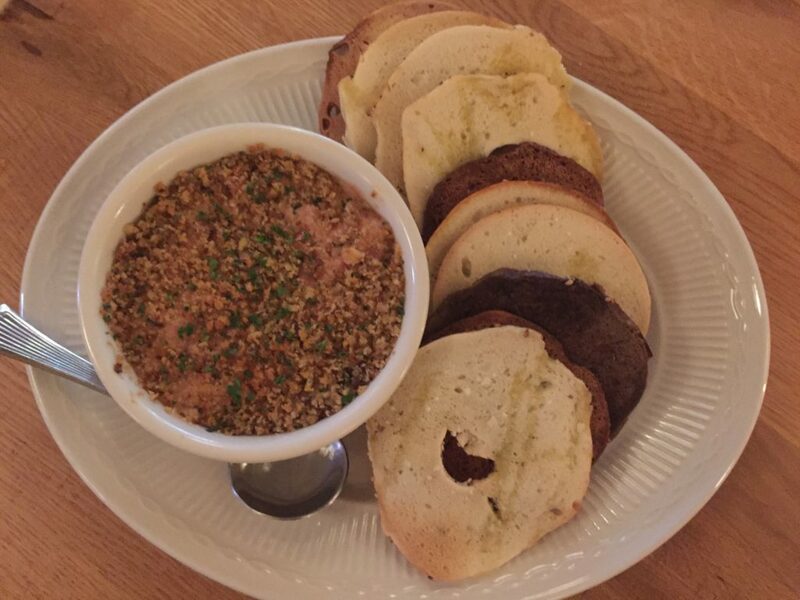 While enjoying your drinks, be sure to nibble on the Hot Reuben Dip, a cheesy delight served with a rainbow of bagel chips made with thinly sliced Block’s Bagels. The matzo ball soup is comfort food at its best, and many of the “noshes” feature favorites with a twist. A few examples: massive latkes with caviar, salmon, and green apple; Brussels sprouts with goat cheese, pumpernickel, and mustard vinaigrette; fried stuffed olives with lamb and cucumber yogurt. For mains, you can go casual or select from fancier entrees. I opted for a lighter dish after all those bagel chips and added salmon to the Grain Salad; it was excellent. I enjoyed the blend of flavors and textures from the wheat berry, kale, quinoa, apple, almonds, figs, and feta, plus the spicy honey dressing. Looking for something between bread? 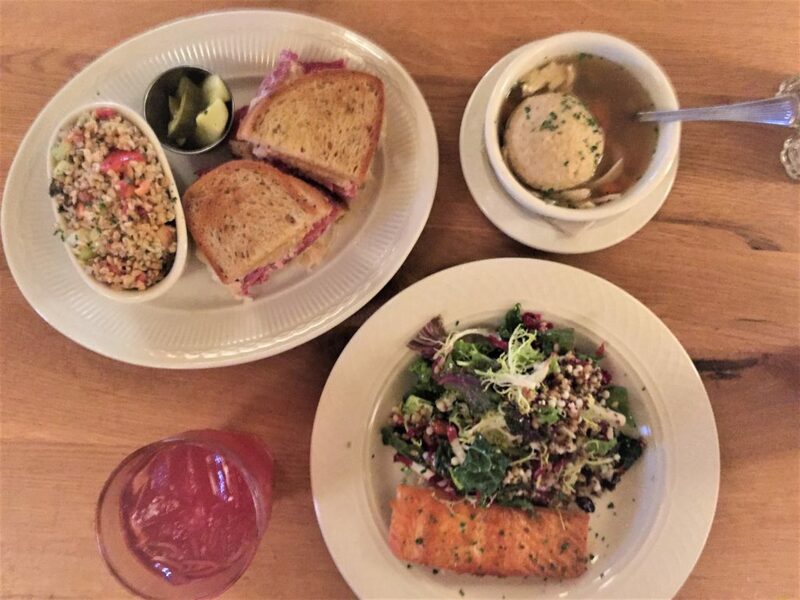 Choose the Reuben, Hot Corned Beef, or a Falafel Hoagie (there’s also more choices) and pair them with potato salad, coleslaw, or fries, as well as the mandatory pickle. For more composed dishes, the menu sports selections like Roasted Chicken Tabbouleh, Halibut with raisins and chili relish, and Pomegranate Braised Lamb alongside chickpeas and radish citrus salad. 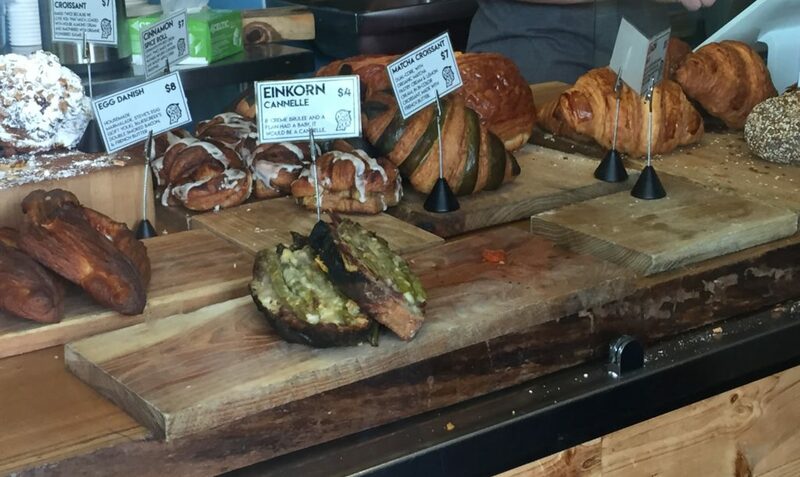 Save room for a black and white cookie for dessert, or the Chocolate Babka. Harvey & Ed’s babka dessert consists of a bread dough rolled into a spiral with chocolate pieces, then sliced and prepared into French Toast. The result is a gooey, melty chocolate confection crowned with whipped cream and berries. 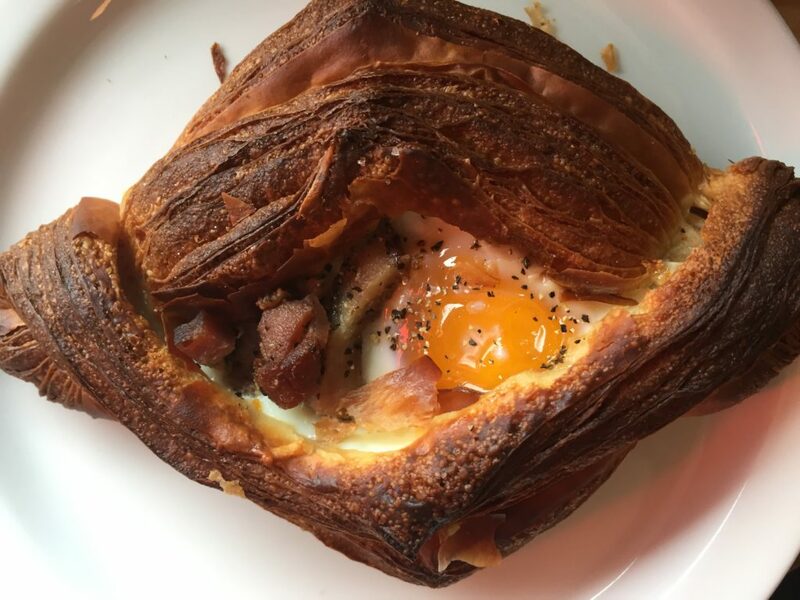 I’ll have to make a return for brunch too; the menu’s Pastrami Hash and Knish Quiche are calling my name, but I also could use an excuse to eat that Babka again. Culinary Clue: Harvey & Ed’s was one of this year’s Bucket List restaurants. Check out the full post for the entire list of new and old establishments that I’m making sure to sample in 2018. Shoot me a message over on Instagram and let me know your favorite dish at Harvey & Ed’s if you’ve visited! Disclosure: I received a complimentary meal from Harvey & Ed’s. All opinions in this review are my own, as was the decision to write this post. 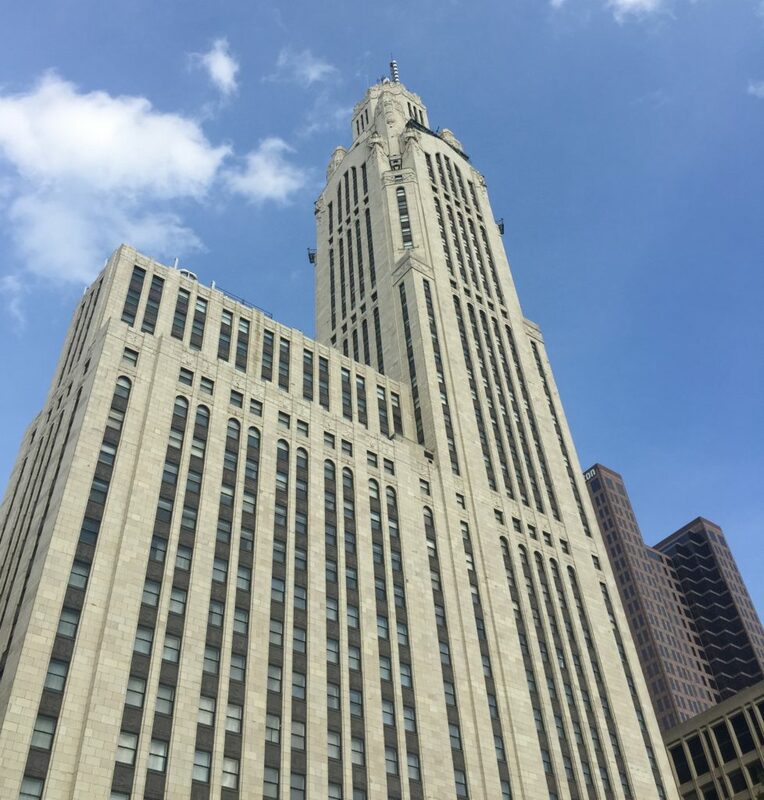 It’s hard to miss the LeVeque Tower on the Columbus skyline. Architecturally beautiful, imposing, and frequently lit up in honor of holidays or social causes, the grandeur of this historic building is now available to the masses by way of Hotel LeVeque. Consequently, when I received an invitation to visit LeVeque Tower and stay at the hotel, I jumped at the chance. I’ve been dying to have a Columbus staycation, and this was the perfect opportunity to be a tourist in my own city! 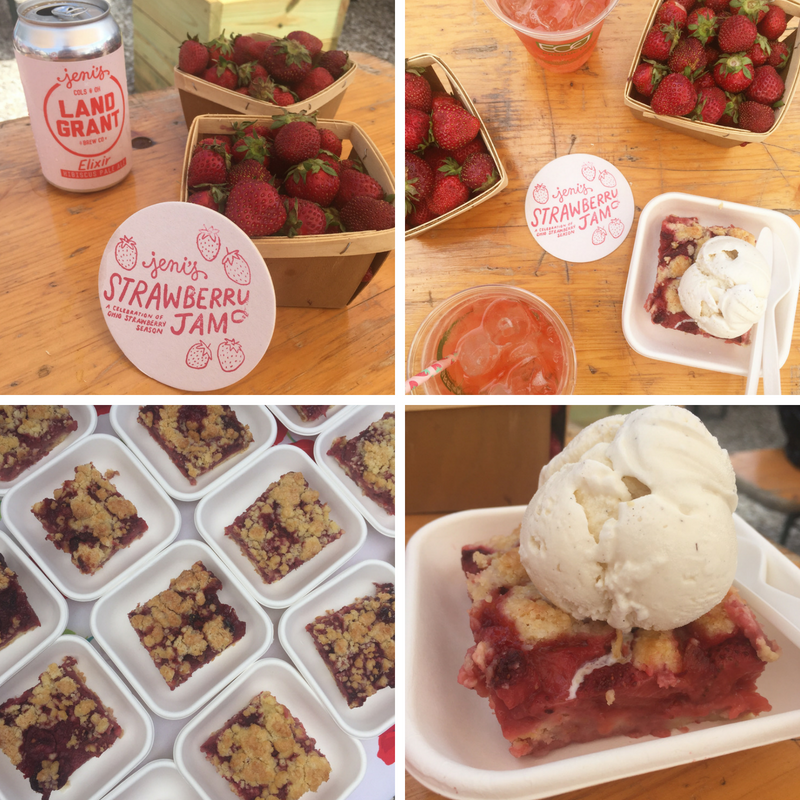 I immediately began planning our overnight getaway, and setting my walking foodie itinerary. When you first step into the lobby at Hotel Leveque, your eyes might have trouble adjusting. There is so much to take in: thoughtful lighting, gilt mirrors, and lux upholstery. Upon viewing our room, I couldn’t help but swoon and hope that their designer would come make over my house. The decor is elegant and plush, far from the stale, generic furnishings that are the trademark of so many travel accommodations. There is a subtle celestial theme throughout Hotel LeVeque, from the constellation artwork, to the telescope on the shelf in our room, and even the turn-down service, which featured a projector illuminating the ceiling of our darkened room in a soothing array of stars and galaxies. I think my husband was embarrassed by my excitement over this feature, but I consoled myself by eating the chocolate truffles the staff also kindly left for us. We started off our dine and dream adventure after freshening up by going and exploring the parks and buildings adjacent to the hotel, including some nooks I’d never discovered before, including a pretty landscaped area near City Hall and the World’s Largest Gavel by the Ohio Supreme Court. Next, we strolled to Veritas for some light appetizers and cocktails, just a short walk from the hotel. 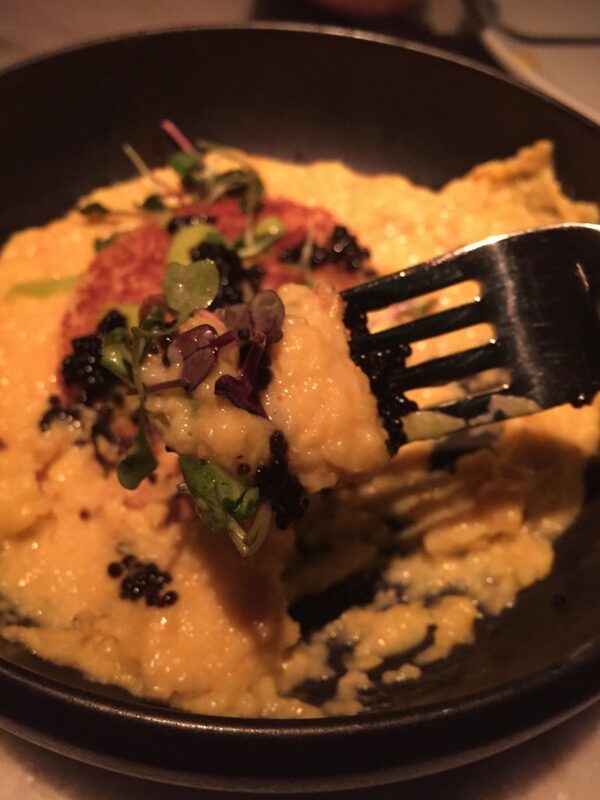 If you haven’t been to Veritas, the candied bacon risotto is a must, as is the Citizens Trust bar above the restaurant (see my full post for more on this). Later, we headed back to LeVeque for our main meal at The Keep, the in-house restaurant. I’ve written about visiting The Keep previously, and this visit for late night dinner and drinks was just as enchanting. 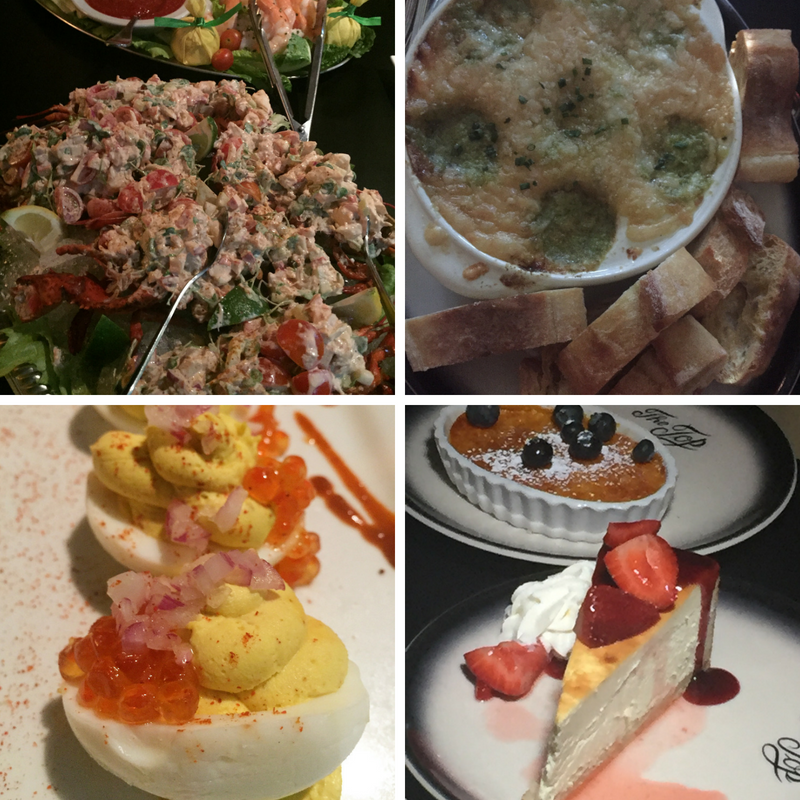 We devoured plates of short ribs with scallion pancakes, steak tartare with a quail egg, the ultra-rich and decadent Corn and Caviar dish, and a dessert special of smores cake (hey, I was on “vacation”) in the cozy, gas-lit dining area. Make sure you wash this all down with a bourbony beverage from the fabulous bar. 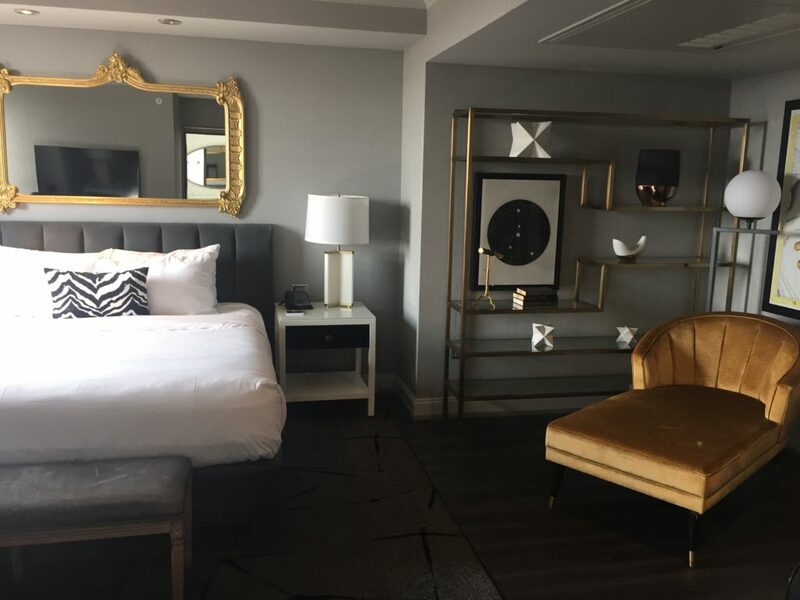 The concierge had a wealth of knowledge about other spots within walking distance too, so there are plenty of dining options to choose from for a return visit. After a good night’s rest, we were famished of course. Next time, I will definitely plan to eat brunch at The Keep in the morning. 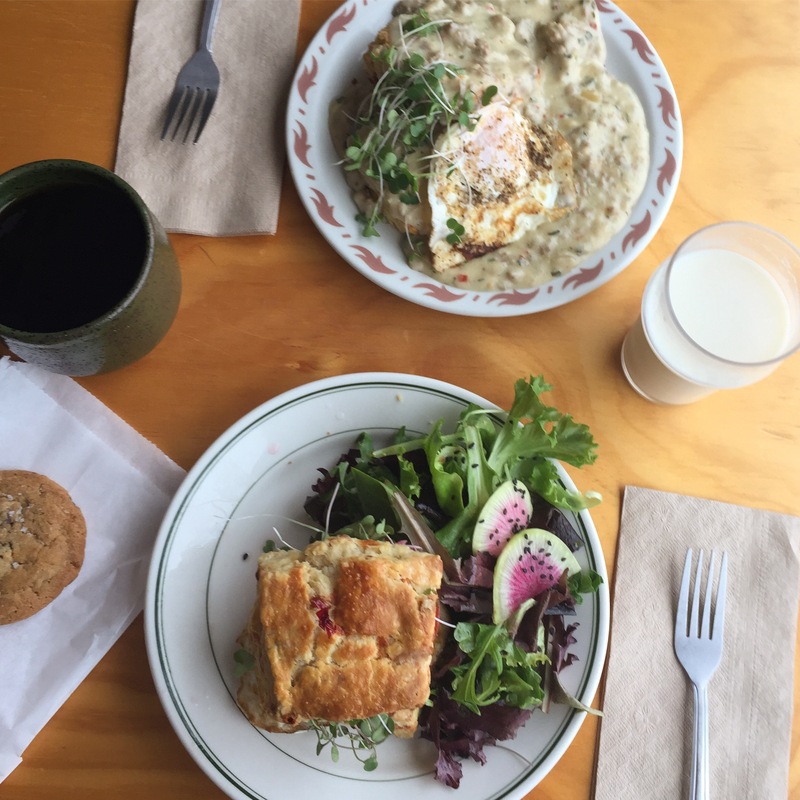 But if you are looking for an outside breakfast within walking distance, I can’t say enough good things about Cravings Carryout Cafe, just a block away. I’m in love with their bronuts (brioche donuts) and iced coffee. On the casual side, Jack and Benny’s is also nearby and serves up traditional diner grub like bacon, eggs, and buckeye pancakes. Milestone 229 brunch is another good selection for a morning jaunt and scrumptious fare. Checkout isn’t until noon, so lingering with breakfast room service is always an option too. Lastly, I have to mention that this hotel really focuses on personal touches and local partners as well. The Candle Lab even created a custom LeVeque candle, perfumed with the bergamot and lavender to mimic LeVeque’s signature scent. 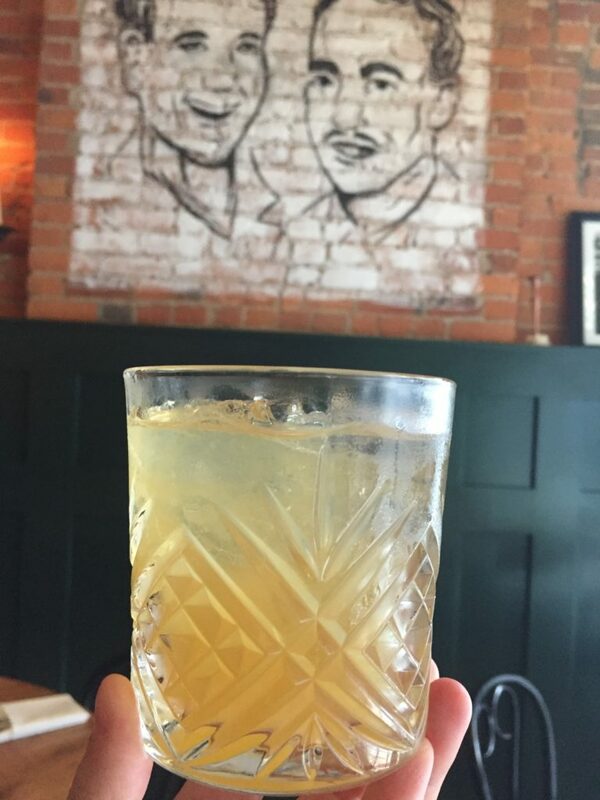 Watershed Distillery is heavily featured on the cocktail menu at The Keep, as are offerings from other local makers. Overall, can you tell I was sad to check out the next morning and get back to real life? 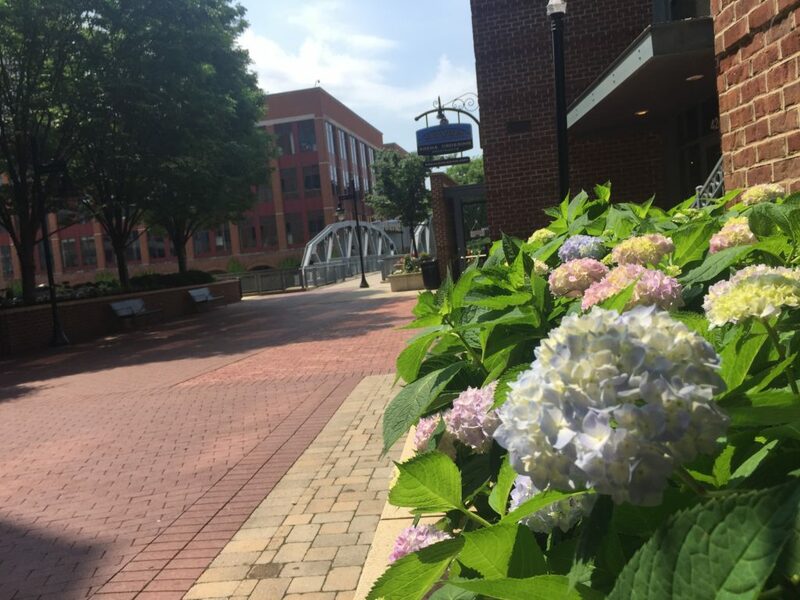 Does anyone else love to staycation as a way to explore Columbus? What neighborhood should I immerse myself in next with an overnight stay? Bonus points for walkability. Disclosure: My overnight stay at LeVeque was complimentary, but all opinions are my own. Fast-casual and chef-driven aren’t concepts that you expect to find in descriptions of the same restaurant, but Veranico Kitchen + Provisions is breaking the mold. 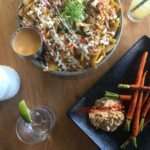 Healthy, delicious, locally sourced, and fast – what’s not to love about this Arena District joint? Veranico comes to the capital city by way of the same owners as Market 65, the Chipotle-esque salad spot downtown. This association explains a great deal about the tasty vegetables that Veranico is dishing up, but there is a lot more to love than just salads on the menu here. I’m no interior design guru, but Veranico’s decor is far from cold and corporate. The atmosphere consists of bright pops of turquoise, an artist-created tile wall, weathered wood, succulents, and sunshine. This setting makes it a cheery place for lunch or a happy hour beer. However, the main focus here should be the salads, in suggested combinations, or you can build your own custom veggie tower. 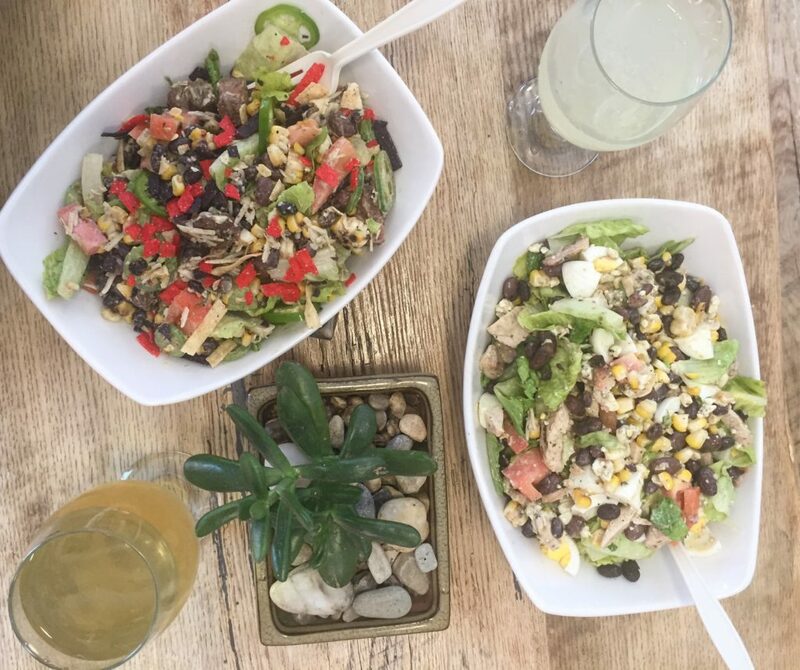 Each salad bowl is enormous and piled high with goodies. I am the type of person that likes the toppings more than the lettuce, so this is right up my alley. Furthermore, the ingredients are local whenever feasible, and as many components as possible are created or prepared in-house, such as caramel apple vinaigrette, charred corn cut right off the cob in front of you, Shagbark Seed and Mills bean salad, and just-roasted Brussels sprouts. 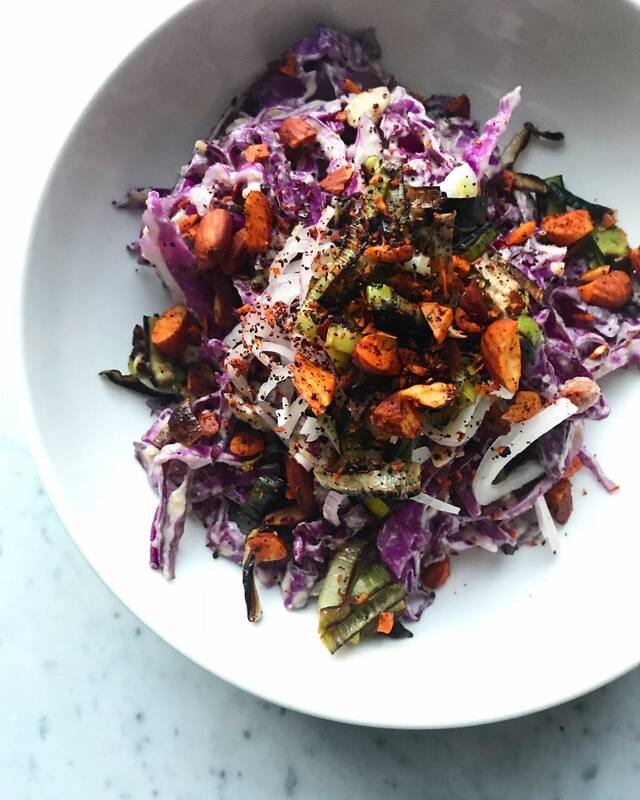 The signature salads encompass flavors from all over the world, like the Samjoko, filled with Korean BBQ and peppers, the Delhi (tandoori chicken and feta), or the Mexican-inspired Adobo Cobb. If you choose to concoct your own salad, you get to select every element from lettuce to cheeses to protein. 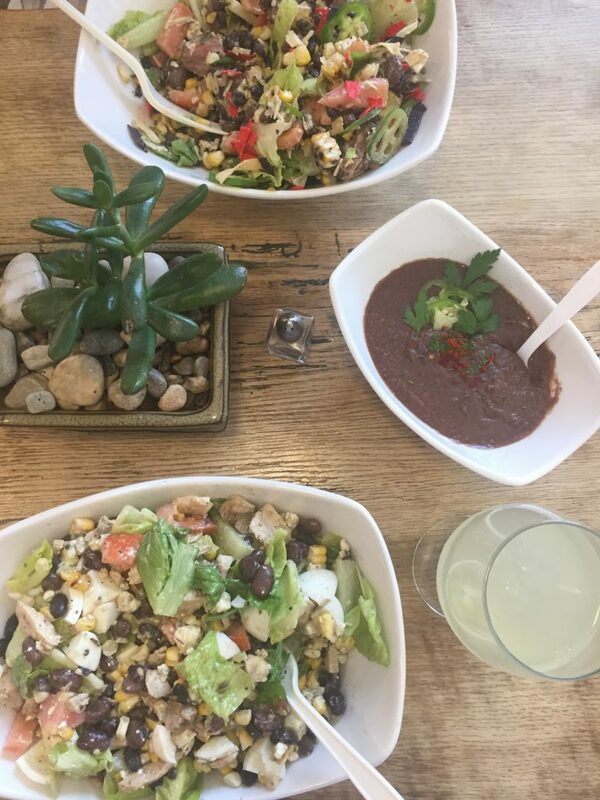 There are so many options that are unique for a salad spot too, such as edamame, pear, curry chickpeas, watermelon radish, buffalo cauliflower, and avocado ranch dressing. 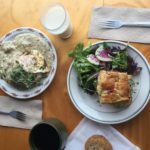 Make sure you don’t fill up on those massive salads though – you’ll want stomach space for the rotating cookie special and the other savory treats. I found an unexpected delight in the Caribbean black bean soup, even though the summer heat topped 90 degrees when I sampled it. Creamy, slightly spicy, and with just a hint of brown sugar, all these tastes meld together for an incredible flavor experience. I will be attempting to recreate this dish (probably unsuccessfully) at home soon. Also available for hungry diners: grain or black bean bowls, as well as fresh panini sandwiches. 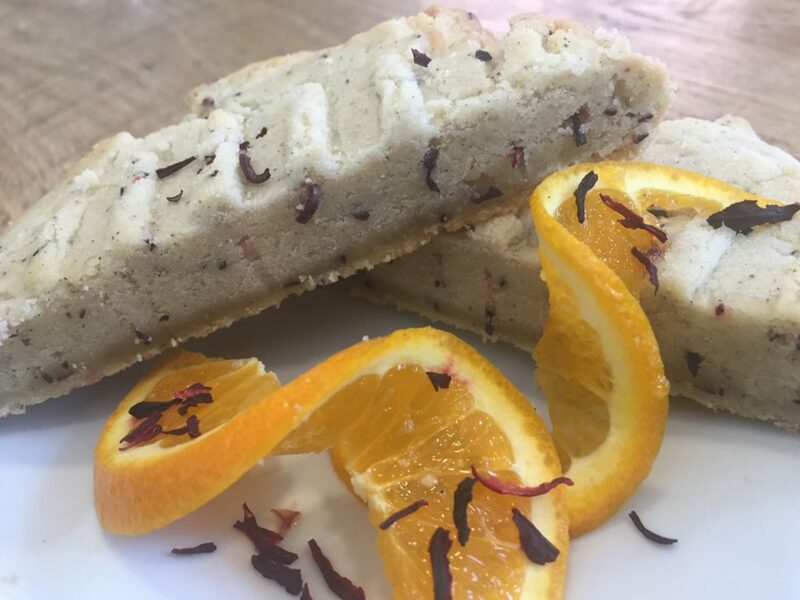 The day of my visit, the cookie feature was a hibiscus sage shortbread. It was puffy and perfect, and left me wondering why sage isn’t used in desserts more frequently. Other previously offered versions of cookies include coconut cream cheese or brown butter cinnamon. The granola bars are sweet enough to count as dessert, made from scratch with luscious honey caramel. Take a swig of the fresh mint tea or lemonade to go with your meal too, or mix them together for the best Arnold Palmer imaginable. There is a small bar inside as well, with a few beers on tap, wines, and happy hour specials. In case you couldn’t tell, I’ll be headed back to Veranico soon. If you’ve been, tell me you favorite salad combo in the comments below! Disclosure: The Arena District team invited me to come and try Veranico. All opinions of my experience reflect my own honest views. 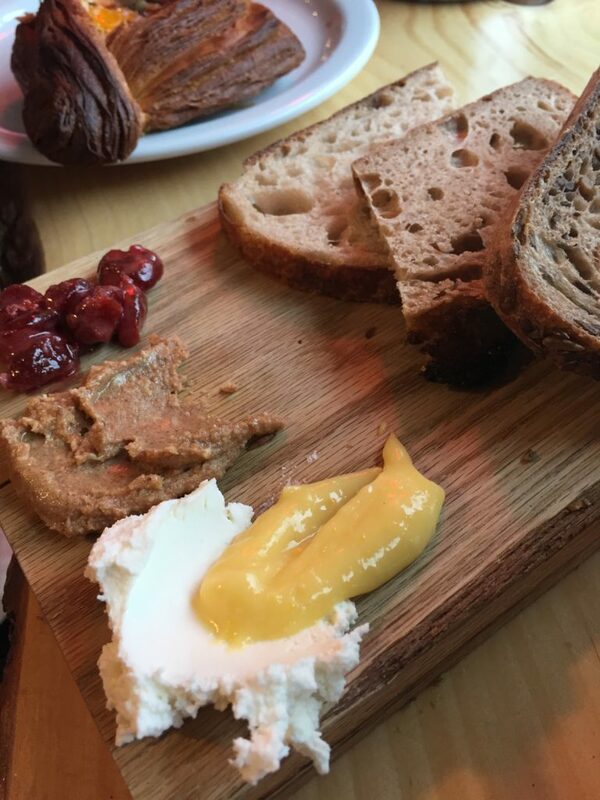 Is there anything better in life than breads and spreads? Dan the Baker doesn’t think so, and I’m inclined to agree. Tucked onto a side street near Grandview that you probably never knew existed, Toast Bar is a mecca of carb-loaded deliciousness. I almost hesitate to write about this place, because I love that it’s such a hidden gem. You may have caught Dan’s creations previously at Weiland’s, Hills Market, or the Worthington and Clintonville Farmers Markets; however, trying the mix-and-match toasts is something you need to head to the shop to experience. The seating area is teeny, so many patrons seem to grab their goods and go, but I managed to snag a stool at the window. The signature item at Toast Bar is naturally the toast flight. From the ever-changing menu, you select three breads and three toppings to slather and smear on, to make your own custom board. Dan’s crew is churning out all varieties of bread imaginable for you choose from: garlic asiago, country sour, sesame, olive polenta, sun flax, and sprouted grain, to name a few. Spreads are often made in-house or sourced locally, and include house-made butter, lemon curd, strawberry jam, or maple almond butter. You can’t go wrong with any combination, I promise. 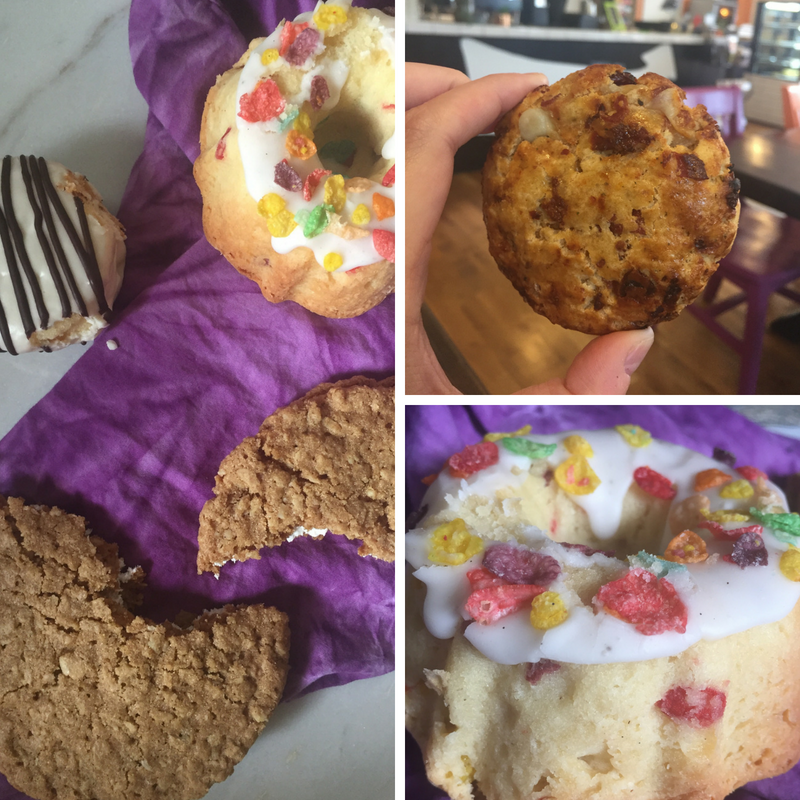 The highlight is the toast bar portion of the bakery, but don’t miss out on the pastries either. The “cruffins” are a croissant dough sprinkled with granulated sugar, rolled in a muffin shape, and stuffed with fillings like raspberry cheesecake or peaches and cream. Toast Bar serves up cookies, matcha or regular croissants, and of course, loaves of bread for sale as well. I scarfed down a tasty egg danish (buttery dough enveloping local bacon, pepper marmalade, and an egg) during my last visit too. The coffee menu is a little pricey, but I have to say, I really enjoyed my iced latte sweetened with maple syrup, and the Ohio honey vanilla latte caught my eye for next time. Culinary Clue: Toast Bar just announced that they are expanding their hours to 8am-2pm Wednesday-Sunday. There will also be additional lunch options in the form of salads and sammies, so I can’t wait to return to try these offerings! Have you been to Toast Bar? Send me a message on Instagram and tell me your favorite bread and spread pairing! Listen, I like wearing jeans and drinking a hoppy beer as much as the next girl. But sometimes, I just want to be fancy and pretend I’m Lady Mary from Downton Abbey. Is this too much to ask? My mom also hosted a super snazzy afternoon tea to celebrate the Downton Abbey finale, so I suppose it’s genetic. However, if you aren’t into washing delicate china and making scones from scratch, there are plenty of local spots that will serve up an elegant afternoon tea just for you. Some girlfriends took me here for my birthday this year, and we had the best time. 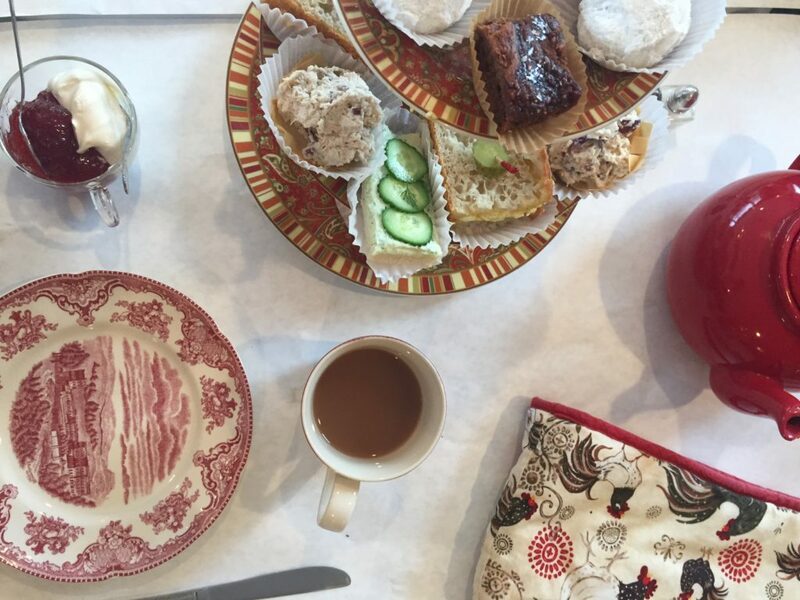 This is traditional afternoon tea at its finest: white tablecloth service, three-tiered platters piled precariously with desserts, fluffy scones with homemade jam and clotted cream, and mini sammies, plus the cutest tea cozies. Even the milk and sugar vessels are appealing! Make sure that you call ahead for reservations – the seating area is small and scones sell out fast. I love visiting uptown Westerville, but even more so that Asterisk is on the scene. The decor is library-themed, and they make some delicious craft cocktails if you want something stronger on the side. The afternoon tea here is served 7 days a week, which is extremely convenient for busy folks who can only make it on the weekends. Asterisk boasts the most delicious ham, brie, green apple, and dijon tea sandwiches, in addition to multiple scones, sweets, and a wide variety of teas. ZenCha has more teas than you’ve ever dreamed of on their menu: Jasmine Pearl, Chocolate Covered Cherry, or African Safari. I haven’t been disappointed yet in their take on a tea latte either! Instead of your typical high tea fare, this space sports a brunch menu with nods to tea, such as Earl Grey or matcha-infused pancakes and chai-spiced shrimp and grits. ZenCha also can create custom tea party events for bridal showers or other occasions. Koko’s recently closed its Gahanna locale, and is gearing up for expansion to Easton, but you can still get your tea fix at the downtown outpost while you wait. High tea service here will earn you the typical offerings of sandwiches and scones, but Koko’s churns out a rainbow of dainty macarons, cupcakes, and other treats to enjoy with your hand-blended tea too. Don’t miss the theme teas as well, around topics such as Paris, Alice in Wonderland, or chocolate. 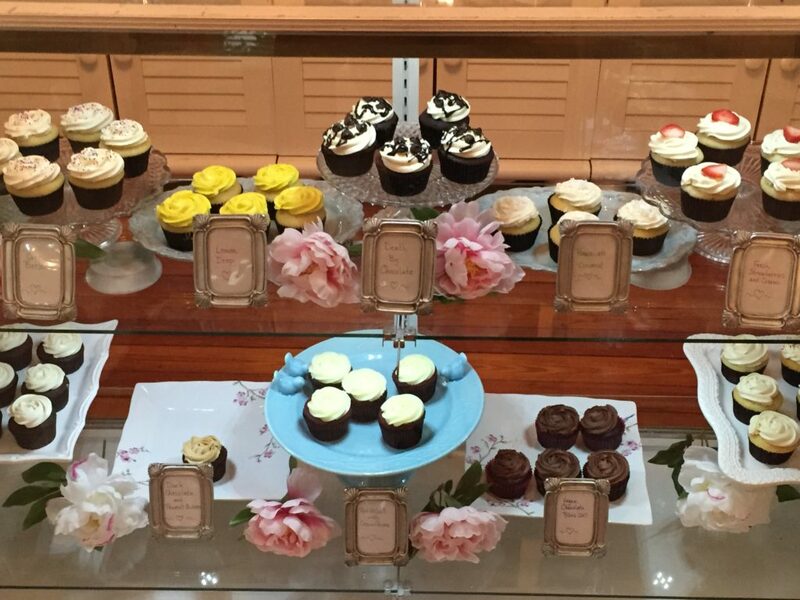 Mozart’s is known for heavenly desserts, but have you tried their afternoon tea offerings? There is often live piano music during dining hours, and plenty of European flair. Order up scones, a miniature apricot Linzer cookie, and teeny cranberry chicken salad canapes or smoked salmon sammies with a pot of tea. Reservations are required for this special menu. Do you have a favorite Columbus tea zone? Let me know in the comments below!